During the project, we will organise the expert workshops which are the important tool to reach consensus on our findings and agree on the design of a shared vision. The workshops will gather experts from the business community, academia, decision making bodies, etc. The results of the expert workshops will help project partners to validate the research findings, engage the relevant stakeholders and enable the knowledge sharing among them. Join our workshops! Register here! 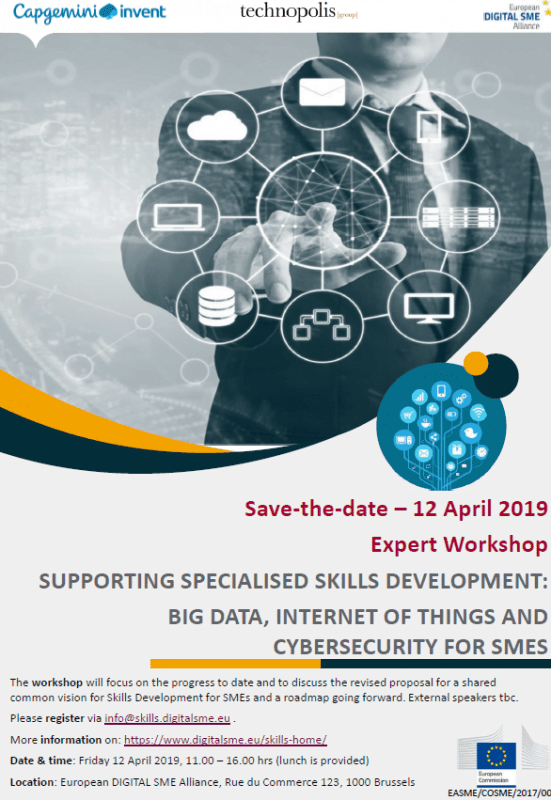 4th Expert Workshop: SUPPORTING SPECIALISED SKILLS DEVELOPMENT: BIG DATA, INTERNET OF THINGS AND CYBERSECURITY FOR SMES. 12 April 2019, between 11.00 and 16.00 at Rue du Commerce 123, 1000 Bruxelles. 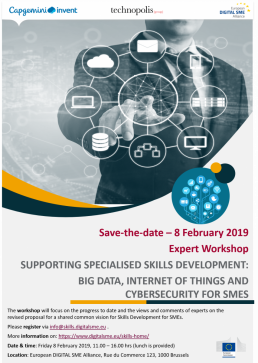 The expert workshop will gather approx. 20 experts from SMEs, academia, education and administration as well as regional initiatives and government stakeholders. 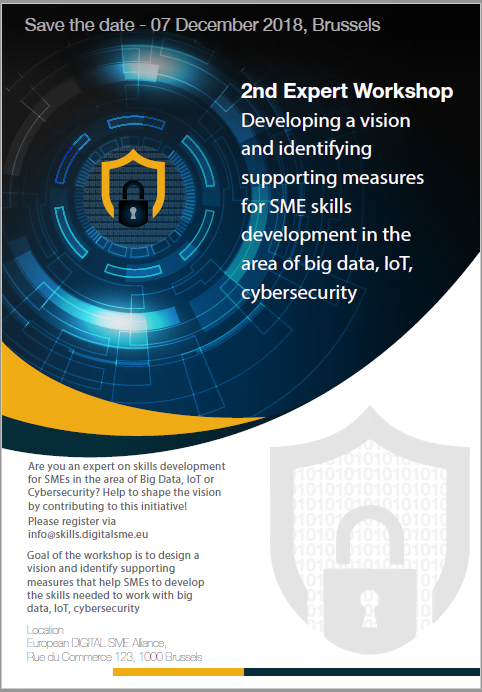 The workshop aims to agree on a shared vision and to identify supporting measures fostering skills development for SMEs. Questions? Contact us at info@skills.digitalsme.eu. 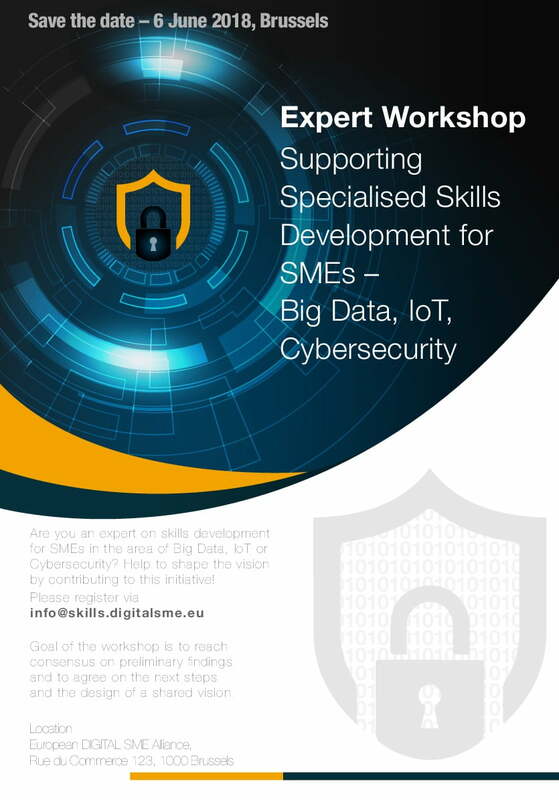 3rd Expert Workshop: SUPPORTING SPECIALISED SKILLS DEVELOPMENT: BIG DATA, INTERNET OF THINGS AND CYBERSECURITY FOR SMES. The workshop aimed to find a consensus on the findings obtained from the project research activities, and to built a shared vision that will fuel the project.